This blessing of the home and inscription of the initials of the three Magi above each door can be performed either by a priest or the father of the family. 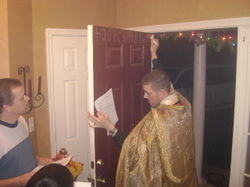 We will be having our house blessing after our priest returns from his vacation. He did our house blessing last year and then we had a great party with lots of food and drinks. I can't wait to do it again! V. Our help is the name of the Lord. to render it helpful to your people. enjoy health of body and protection of soul. And the chalk is sprinkled with Holy Water. Head of Household: “Peace be to this house and: to all who dwell here, in the name of the Lord. 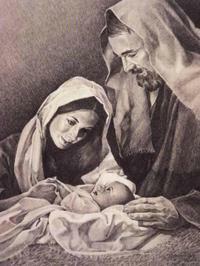 All: Lord God of heaven and earth, you revealed your only begotten Son to every nation by the guidance of a star. Bless this house and all who inhabit it. May we be blessed with health, goodness of heart, gentleness and the keeping of your law. Fill us with the light of Christ, that our love for each other may go out to all. We ask this through Christ our Lord. Amen. January 6th is the Traditional Feast of the Epiphany of Our Lord. I look forward to this great feast day every year. Since I grew up in Puerto Rico and have wonderful memories of this holiday, I decided to continue the tradition of having the 3 Wise Men bring our children gifts, just as they brought the Child Jesus gifts 12 days after Christmas. The kids gather grass or hay and a bowl of water for the camels and put them under the tree, although we used to put the grass in boxes under our beds. In the morning of January 6th, they wake up to find gifts for each of them. Last year they got a huge basket of fruit- mangoes, peaches, pears, tangerines, apples, pineapples and oranges. 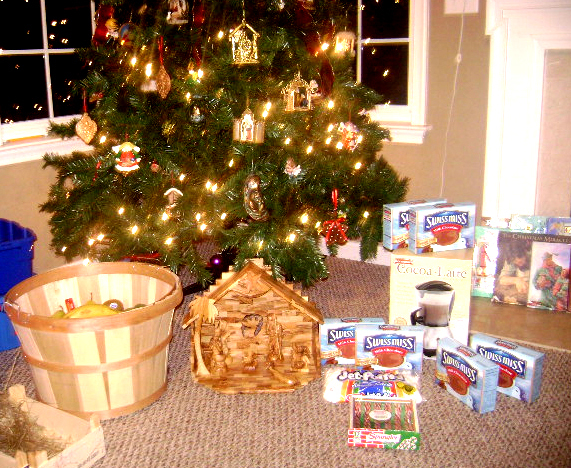 They also got a hot cocoa machine and a box of hot cocoa for each child. In Puerto Rico, the big gifts are given today, instead of on Christmas morning. I can imagine the excitement the children are feeling right now as they wake up to find gifts under their beds. My family will be having a huge celebration today. I would love to leave the big gifts for today, but since this is not a holiday here, my husband usually works on this day, so he wouldn't be here to celebrate with us. Jesus, Divine Victim on the Altar for our salvation, R. have mercy on us. Jesus, hidden under the appearance of bread, R. have mercy on us. Jesus, abiding in Your fulness, Body, Blood, Soul and Divinity, R. have mercy on us. Sacred Host, in which the soul is filled with grace, R. have mercy on us. Sacred Host, in which we are given a pledge of future glory, R. have mercy on us. 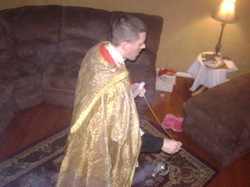 That we may make suitable preparation before approaching the Altar, R. we beseech You, hear us. 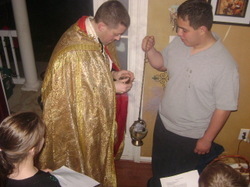 That we may receive You frequently in Holy Communion with real devotion and true humility, R. we beseech You, hear us. That we may never neglect to thank You for so wonderful a blessing, R. we beseech You, hear us. That we may cherish time spent in silent prayer before You, R. we beseech You, hear us. That we may grow in knowledge of this Sacrament of sacraments, R. we beseech You, hear us. 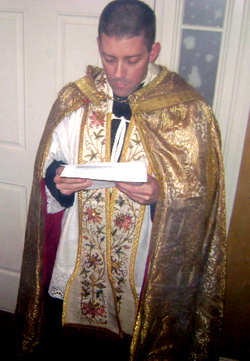 That all priests may have a profound love of the Holy Eucharist, R. we beseech You, hear us. That they may celebrate the Holy Sacrifice of the Mass in accordance with its sublime dignity, R. we beseech You, hear us. 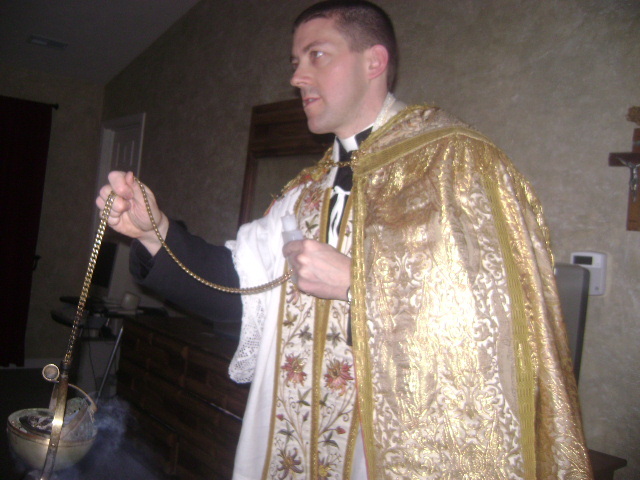 That we may be comforted and sanctified with Holy Viaticum at the hour of our death, R. we beseech You, hear us. That we may see You one day face to face in Heaven, R. we beseech You, hear us. R. all praise and all thanksgiving be every moment Thine. in which Christ the Lord Himself is contained, offered and received. We make this prayer through the same Christ our Lord. R. Amen. This blessing comes from the older Roman Ritual or Collectio Rituum from 1954. V. Our help is in the name of the Lord. R. Who made heaven and earth. V. Our God is full of mercy. R. The Lord has care for little ones. V. O Lord hear my prayer. R. And let my cry come unto Thee. V. The Lord be with you. R. And with your spirit. 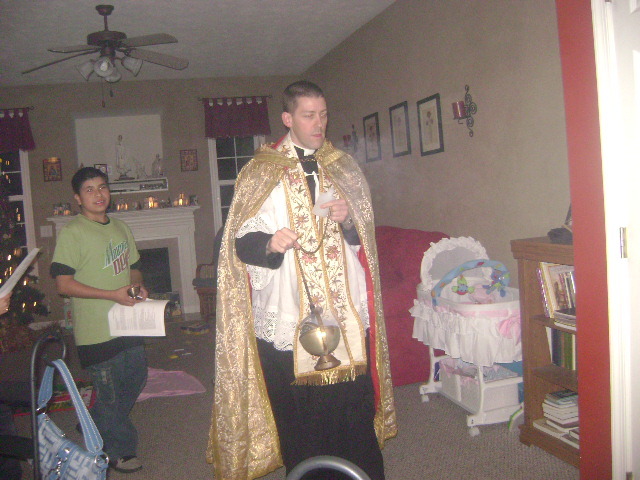 O Lord Jesus Christ, Son of the Living God, Who, begotten in eternity, yet didst will to he born in time; Who dost love the innocence of childhood, and didst lovingly embrace and bless the little children who were brought to Thee: anticipate the needs of this child (these children) with Thy tender blessings, and grant that no evil may corrupt his (her, their) mind, but that advancing in age, in wisdom, and in grace, he (she, they) may live so as to please Thee always. Thou Who dost live and reign with God the Father in the unity of the Holy Spirit, God, for ever and ever. May the peace and the blessing of Almighty God, Father, Son + and Holy Spirit, descend upon you and remain forever. O Shepherd that rulest Israel, Thou that leadest Joseph like a sheep, come to guide and comfort us. O Thou that sittest upon the cherubim, God of hosts, come, show Thy face, and we shall be saved. Last night Fr. Carr came over and gave the Epiphany House Blessing, which included the Blessing of the Chalk. Here are some pictures from last night. This morning the children woke up to to find presents from The Three Wise Men Los Tres Reyes Magos under the tree. 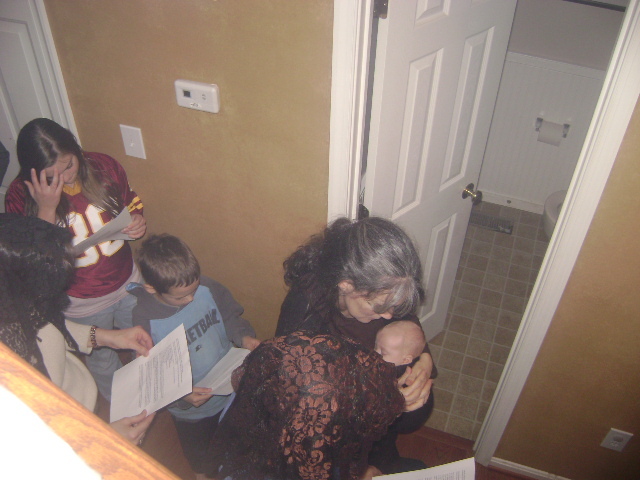 We’ve kept this tradition form my childhood. They collected grass for the camels and put it in boxes under the tree. They got a hot cocoa maker, boxes of hot chocolate, candy canes, marshmallows, and a HUGE basket of fruit with apples, tangerines, kiwis, bananas, mangoes, peaches and pears. Right now, my family in Puerto Rico is roasting a pig and having a wondeful celebration. There is lots of food, music and games. I miss them all very much and I wish we were there with them. Christmas is definately not over yet. Next year for Christmas we’re giving the kids one present each and The Three Wise Men Los Tres Reyes Magos will bring them what they would normally get Christmas morning. May you all have a blessed Feast of the Epiphany. Feliz Dia de los Reyes!